Format: FAT32 (SDHC 16GB-32GB), exFAT (SDXC 64GB-256GB). Capacities: 16GB, 32GB, 64GB, 128GB, 256GB. If a safe place cannot be located or nobody is able to take receipt either at your property or the neighbours?. Format: FAT32 (SDHC 16GB-32GB), exFAT (SDXC 64GB-256GB). Capacities: 16GB, 32GB, 64GB, 128GB, 256GB. Storage Temperatures: -40°C to 85°C. - Class 10 UHS-I speeds up to 80MB/s read. Performance: 80MB/s read and 10MB/s write, UHS-I Speed Class 1 (U1). 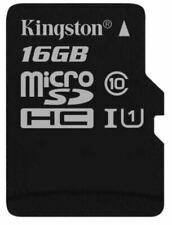 Kingston’s microSDHC/microSDXC Class 10 UHS-I card features Class 10 UHS-I speeds of 45 MB/s read and 10 MB/s write, making it suitable for photographers who shoot everything from still images to kids and pets in motion. It’s available in multiple capacities up to 128GB , to provide plenty of space to capture an entire trip. As such, the actual available capacity for data storage is less than what is listed on the products. For your peace of mind, the card has been extensively tested and proven to be waterproof, temperature proof, shock and vibration proof and X-ray proof.3. As such, the actual available capacity for data storage is less than what is listed on the products. 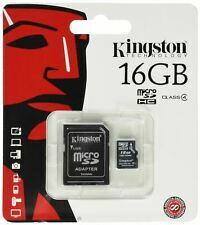 Kingston Technology 16Gb microSDHC, 16 GB, Micro Secure Digital High-Capacity (MicroSDHC), 4 MB/s, Black, Gold, 3.3 V. Kingston Technology 16Gb microSDHC. Capacity: 16 GB, Flash card type: Micro Secure Digital High-Capacity (MicroSDHC), Read speed: 4 MB/s. Class 4 — minimum data transfer rates of 4MB/s. only by microSDHC host devices. They can be used as full-size SDHC cards together with the included adapter. 2 To ensure compatibility, look. All cards are 100 per cent tested and are backed by a. Will also fit to the following models of samsung AND WILL also fit to all makes and models of touch screen phone in last 3 years. Samsung Galaxy Y S5360, Galaxy Mini S5570. samsung Galaxy Tab 4 3 2 Tab S Tablet. It’s available in multiple capacities up to 256GB to provide plenty of space to capture an entire trip. - Schools/Universities & Colleges. - Data Centres. 32GB Adaptor. 10 Years Warranty. It functions with multiple gadgets that have microSDHC or microSDXC card slots. Adapter Type SD Card. Family Line SanDisk microSDHC. Form Factor MicroSDHC. Width 279.4 mm (11"). Expanding your devices capacity and opening up new possibility's. - Capacity: 8GB. - Compliant: with the SD Card Association specification. - Waterproof, Temperature, Shock/Vibration and X-ray proof. Format: FAT32 (SDHC 16GB-32GB), exFAT (SDXC 64GB-256GB). Capacities: 32GB. Storage Temperatures: -40°C to 85°C. Performance: 80MB/s read and 10MB/s write, UHS-I Speed Class 1 (U1). 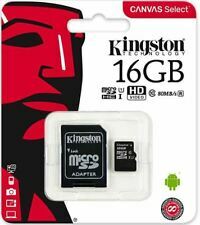 Kingston Technology 32GB microSDHC, 32 GB, Micro Secure Digital High-Capacity (MicroSDHC), Black, -25 - 85 °C, -40 - 85 °C, 1.4 g. Kingston Technology 32GB microSDHC. Capacity: 32 GB, Flash card type: Micro Secure Digital High-Capacity (MicroSDHC). It’s available in multiple capacities up to 256GB, to provide plenty of space to capture life’s adventures. - Schools/Universities & Colleges. - Data Centres. It’s available in multiple capacities up to 256GB to provide plenty of space to capture an entire trip. - Data Centres. It functions with multiple gadgets that have microSDHC or microSDXC card slots. ••Adapter Type SD Adapter. ••Family Line SanDisk microSDHC. ••Form Factor MicroSDHC. ••Width 279.4 mm (11"). ••Depth 381 mm (15"). 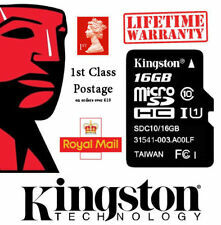 1 x 32GB Genuine Kingston Micro SD SDHC. Increase your device space buy a micro sd card. Faster speeds to capture more on the go. Storage Capacity: 32 GB. Compatible with Model Manufacturer Part Number: SDC10G2/32GB. 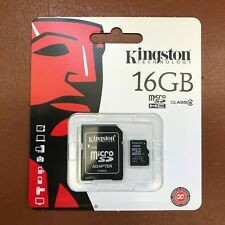 Kingston Canvas Select 16GB Micro SD Card. Format: FAT32 (SDHC 16GB-32GB). Capacities: 16GB. SD Speed Class UHS-I U1 / Class10. Key Features. Storage Capacity 16 GB. Storage Temperatures: -40°C to 85°C. 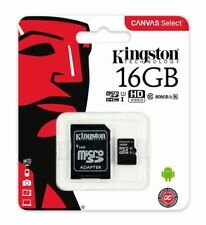 Kingston Canvas Select 16GB Micro SD Card SD Adapter. Format: FAT32 (SDHC 16GB-32GB), exFAT (SDXC 64GB-256GB). Capacities: 16GB, 32GB, 64GB, 128GB, 256GB. SD Speed Class UHS-I U1 / Class10. Key Features. ✅30 DAYS FREE RETURN! ✅FAST & FREE DELIVERY! It functions with multiple gadgets that have microSDHC or microSDXC card slots. Adapter Type SD Card. Family Line SanDisk microSDHC. Form Factor MicroSDHC. A Pair Seat Belt Shoulder Cover Soft Pads Cotton Embroidered Badge Jaguar White. Enhance your mobile life with Kingston's microSDHC removable memory card. This versatile card expands the memory capacity of feature-rich mobile phones. Store more of your own collections of music, movies, video clips, pictures, ring tones and more. With Kingston's microSDHC card, your mobile content is no longer tied to your phone. Share your content collections with friends, family and colleagues easily with this removable storage solution specifically designed for mobile phones with expansion slots. Kingston's microSD memory card also helps you move data between phones. If you're changing service or upgrading your handset, the microSD lets you easily transfer phone lists, settings or ring tones. Its ultra-small size consumes very little power from your handset, to give you longer battery life on your phone. UHS Speed Class U1 and Speed Class 10 for Full HD video recording and playback. 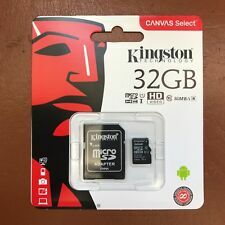 Kingston Class 10 Ultra 32GB Micro SD. - Rated A1 for faster app performance and UHS Speed Class 1 (U1) and Speed Class 10 for Full HD video recording and playback. 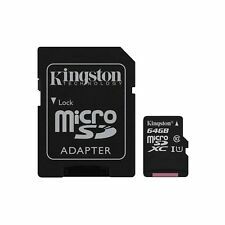 Kingston Micro SD 32GB SDHC Memory Card Mobile Phone Class 10 With SD ADAPTER! 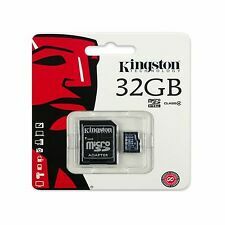 32GB Kingston Micro SD SDHC memory Card Class 10 with card Adapter Mobile Phone!